A win or a loss in week 1 doesn’t tell your season but here are a few things I have learned from week 1. The Baltimore Ravens are back. The Ravens trounced the Bucs 27-0 and their defense looked fabulous. 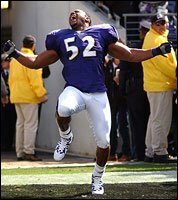 Baltimore’s “D” is not what it use to be but they still have so many playmakers in Ray Lewis, Ed Reed, Chris McAlister to name a few. The addition of McNair finally gives them stability at quarterback and on Sunday he managed the game perfectly. Most importantly the Ravens offense had Zero turnovers and Jamal Lewis ran the ball effectively, controlled the clock. I know it’s early but this Ravens team reminds me a lot of the Steelers 2001 team that went 13-3. A team with a quarterback whose job is to be efficient, not turn the ball over and a running game that has the ability to grind out yards and control the clock for a substantial time to keep their defense off the field. The Cincinnati Bengals are either really good or the KC chiefs are very bad. In the off-season I picked KC as my dark horse team that could make a run at the Steelers in the AFC but that was before pro bowler left tackle Willie Roaf retired days before training camp opened. The Bengals manhandled the Chiefs in the trenches and the loss of Roaf is going to hurt this team more than Trent Green being out with a concussion. With Green out for 2 games at the minimum the Chiefs playoff hopes are going to be on the legs of Larry Johnson who will be going up against 9 man fronts until Green returns. A nice solid win for the Bengals and what a year it’s going to be in the AFC North between the Steelers, Ravens and Bengals. How great was it to see Dallas lose to Jacksonville 24-17 in Terrell Owens debut. Drew Bledsoe threw 3 int’s and the media is already calling for backup quarterback Tony Romo to take over for Drew Bledsoe. What a mess things are going to be in Dallas. Can anyone picture Terrell Owens being able to deal with catching passes from Tony Romo. Who? Anyways, what a game Donovan McNabb had throwing for 3 td’s and Terrell Owens replacement Donte Stallworth finished with 6rec 141 yds 1 td. The Eagles are going to win the NFC east. Peyton Manning is 1up on younger brother Eli but the Colts showed they still have a glaring weakness; stopping the run. Tiki Barber ran all over them averaging over 6yds per carry and backup running back Brandon Jacobs also averaged 6yds per carry; finishing the day ( 8 – 54 yds ). When mentioning the Giants how can I go without mentioning my boy “Plaxico Burress”. Plax made two acrobatic catches ( 4catches – 80yds – 1td ). Finally after all these years Plax is moving into the upper echelon of wide receivers. How about the Oakland Raiders getting shutout by the San Diego Chargers. The game plan for the Chargers was excellent. They put the game on LT’s shoulders and let Phillip Rivers ( 8 for 11) hand the ball off continously and make a throw here and there. Result: 27-0 victory. The Raiders are awful and will be lucky to win 4 games this season. Randy Moss needs to find a way to get out of Oakland. The Pittsburgh media needs to relax. Following Pitt’s 33-15 win against Cincinnati, the media especially Ron Cook of the Post-Gazette made it seem like Pitt lost 33-15. This team is young but the few mistakes they made at the end of the game are not a big deal. Young teams learn from mistakes and it might have been a good thing to happen against Cincinnati not Michigan State. HB Blades was once again named Big East defensive player of week. Looking at Pitt’s schedule, if they can get past Michigan State it’s not a understatement that Pitt could be 7-0 heading into week 8 against Rutgers. Coach Dave Wannstedt announced at his weekly press conference that freshman running back Dorin Dickerson could be seeing some time. I disagree with this move. Dickerson should be redshirted because as of right now he is 4th on the depth chart and when healthy Howlings is going to get the majority of the runs. Doesn’t make sense to waste a year of eligibility to run the ball 3-5times a game. What a matchup it’s going to be on Saturday between Pitt cornerback Darelle Revis and 6ft6 wideout Matt Trannon. Coach Cowher announced today that Ben is questionable for Monday nights game and he won’t make a decision on who will start until Sunday at the latest. I expect Ben to play as he was on the practice field today throwing to receivers despite it being a off day.